The cost of keeping tigers alive in the wild is about $80m (£50m) per year, say conservationists - but only about $50m (£30m) per year is being pledged. The figures come from a new assessment that suggests targeting efforts in 42 selected breeding sites. Building tiger populations in these sites would enable other areas to be re-populated later, the researchers report in the journal PLoS Biology. About 3,500 tigers remain in the wild, and only about 1,000 breeding females. Although conservation programmes are operating in some countries, notably India, the tiger has virtually disappeared from vast tracts of Asia where it used to live. Once found from Turkey to the eastern coast of Russia, it is now concentrated in pockets of South and East Asia, though even here it is extinct in some countries such as Pakistan and down to fewer than 50 individuals in others, including Cambodia, China, Laos and Vietnam. The animals are found in only about 7% of their historical range. But the new study suggests conservation would benefit from concentrating efforts into still smaller areas - specifically, into 42 "source sites" that make up only about 6% of the tiger's current range, or about 0.5% of the area it used to span. "The long-term goal is to conserve an Asia-wide network of large landscapes where tigers can flourish," said Nigel Leader-Williams from Cambridge University, one of the scientists on this study. "The immediate priority, however, must be to ensure that the few breeding populations still in existence can be protected and monitored. Without this, all other efforts are bound to fail." The figure of $82m per year is the cost of safeguarding and monitoring populations in these 42 key sites. All but 10 lie in India, Sumatra and the eastern extremities of Russia. "A number of these source sites are already in protected areas," noted John Robinson, executive vice-president for conservation and science with the Wildlife Conservation Society (WCS). "However, in many of them the protection is weak, and it would not take much to push them over the edge," he told BBC News. More than half of the figure is already being provided by the range states themselves, by international donors and by conservation groups. But the shortfall is about $35m (£23m) - and unless the money is found, this study concludes the tigers will not endure across what remains of its range. 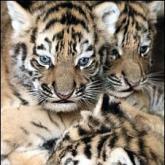 The big hope this year is the Tiger Summit, to be hosted by Russia's Prime Minister Vladimir Putin in St Petersburg. Orignally slated for this week, it has been postponed until November in the hope of attracting a greater number of national leaders. One of the facts they will consider is that there are now many more tigers in captivity than in the wild. While that might seem to indicate how far the creature is from its natural place in the world, Dr Robinson prefers to find a glimmer of optimism. "It says something about the fact that tigers can breed easily, if you can protect them," he said. "They do this in captivity; and if we can protect them in the wild too, they can bounce back."